No matter what defensive system a team is running, there are a handful of areas in which the team must stay vigilant. First is getting back in transition and matching up to keep the ball away from the rim. Then it’s defending without fouling and eliminating easy opportunities for opponents to knock down free throws. With the way the league is trending, every team must also defend the three-point line, minimizing wide open opportunities to knock down the most potent shots in the game. The Thunder and Head Coach Billy Donovan have a plan for all that, and it stems from the personnel that exists on the roster. The versatility, athleticism and quickness of the group is only outdone by one crucial factor – length. It’s a coveted attribute in today’s NBA because it gives players a mulligan for many potential defensive mistakes. Being able to fly out to the perimeter to contest a shot or deter one from even being taken in the lane are crucial ways where the Thunder can use its team’s profile to its advantage. For now, the Thunder isn’t getting to do a ton of five-on-five work, although they did get some live work in at the end of both practices. With both Russell Westbrook and Andre Roberson sidelined, the Thunder coaching staff is keeping the two backcourt stalwarts heavily involved in the mental portions of practice that will be going on all week long. The team is using 2-on-2 drills to emphasize pick-and-roll coverage, putting players in transition defense and other isolated situations to test out the basic principles, which players are clearly understanding right away. Even without the open minutes available due to Westbrook and Roberson’s absence, there will be heavy competition on the roster for playing time this year. There’s a plethora of wings who, as a part of the Thunder’s consistent move towards position-less basketball, know that there is one surefire way to get onto the court. “Definitely play defense,” Luwawu-Cabarrot stated. “Do whatever the coach says, try not to make mistakes, and just be a good teammate." - Speaking of defense, Donovan said that he’s continued to be encouraged by Alex Abrines, the third-year guard who has made strides last season as a player who could stay in front of the ball and put his body into plays. Abrines will certainly be a candidate to log heavy minutes this season. Having a year under his belt, having learned the league a lot more, I thought he was a drastically better defender and I thought (assistant coach) Darko (Rajaković) did a really good job working with him in trying to focus on the pre-practice skill development of working with him defensively,” Donovan said. “The other part that was huge too is I think the strength and conditioning staff did a great job of helping him physically get stronger." 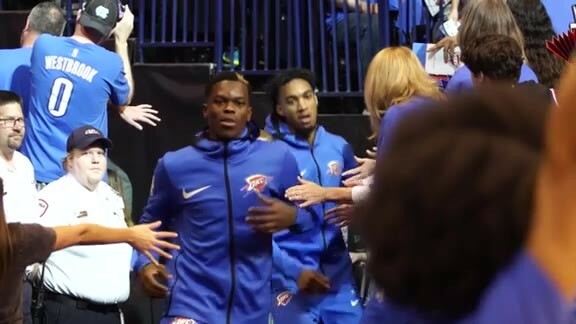 - On the other end of the floor, the Thunder is getting used to the new look provided by point guard Dennis Schröder, who has been running the offense with Westbrook on the sideline. Donovan broke down the differences between the two players and added his feelings on how the Thunder must play on the offensive end this season. “We’ve got to play faster and that doesn’t mean when we are playing faster we need to shoot faster, but we need to come across half court faster, we need to play with more pace and more tempo, we need to cut and move better,” Donovan added. - It remains to be seen whether forward Patrick Patterson will again come off the bench this season or be inserted into the starting lineup, but either way he should be able to help Donovan accomplish his vision of a team that plays with incredible pace and tempo in the half court. 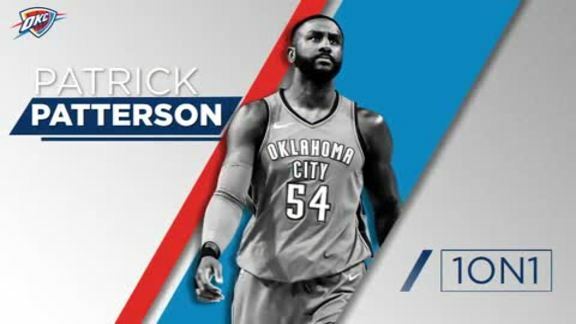 Due to an offseason diet change, Patterson looks to be in fantastic shape physically, ready to give the Thunder a shot in the arm on both ends of the floor. - Luwawu-Cabarrot has been working on not only his defense but has also been developing his offensive skills with Thunder assistant coach Vin Bhavnani so far in camp. Specifically, Luwawu-Cabarrot listed that he aims to be stronger on his drives, better with his handle and sharper with his shooting stroke.